FDA Gets Advice To Approve First Pill To Cut HIV Infections : Shots - Health News A panel of experts said that Truvada, a daily pill, could help protect healthy people at high risk for HIV infection. The benefits, in their view, outweigh possible side effects, including kidney damage and a dangerous increase in acid in the blood. In what could mark a watershed in the fight against HIV/AIDS, a panel of experts recommended that the Food and Drug Administration give a green light to a pill that can cut the risk of infections. 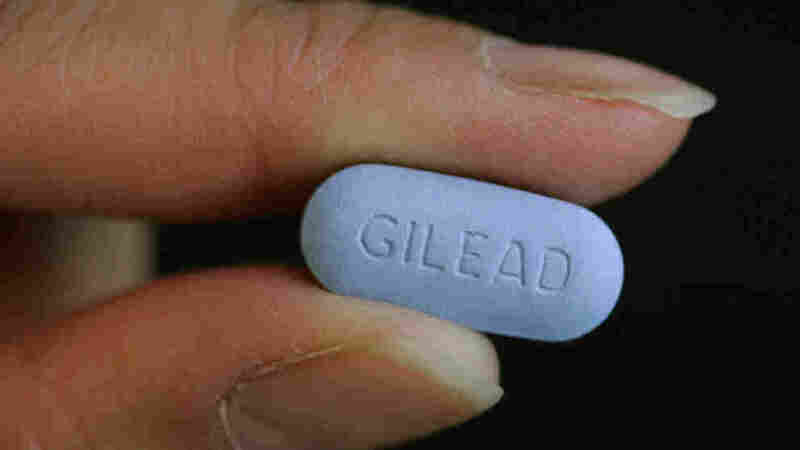 The daily pill, Truvada, made by Gilead Sciences, combines two medicines that inhibit the reproduction of HIV. It's already approved as a treatment for HIV, but its use could soon expand to include protection of uninfected people. The advisory panel concluded Thursday that the benefits to healthy people vulnerable to HIV infection outweigh the risks, including such side effects as kidney damage and a dangerous increase in acid in the blood. The people the panel has in mind are gay and bisexual men and heterosexual couples in which one partner is positive for HIV. About 50,000 people in the U.S. become infected with HIV each year, according to the Centers for Disease Control and Prevention. The majority of new infections are in gay or bisexual men. There's no guarantee the FDA will heed the panel's advice, but the agency typically does so. A decision is expected by June 15. Studies have shown that Truvada can reduce the risk of HIV infection by 63 percent or more over the course of a year. But the drug is expensive — about $11,000 a year in the U.S. Some critics think money would be better spent on other means of prevention. Now, it's already the case that doctors in the U.S. are free to prescribe an approved medicine for any use they see fit. And some do. But even after data first showed Truvada's ability to protect against HIV infection, a doctor at a Boston clinic told Bloomberg News that people weren't beating the door to get it. One worry, some doctors say, is that healthy people may not stick with the daily Truvada regimen, undercutting its effectiveness.